Figure 2. 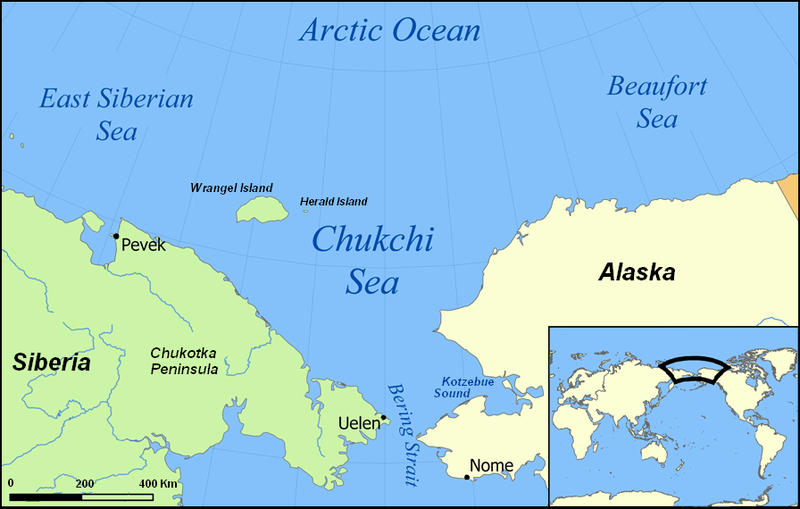 Locations of polar bears captured in the eastern Chukchi Sea between 2008 and 2010 by the US Fish and Wildlife/US Geological Survey’s Chukchi Sea research teams. 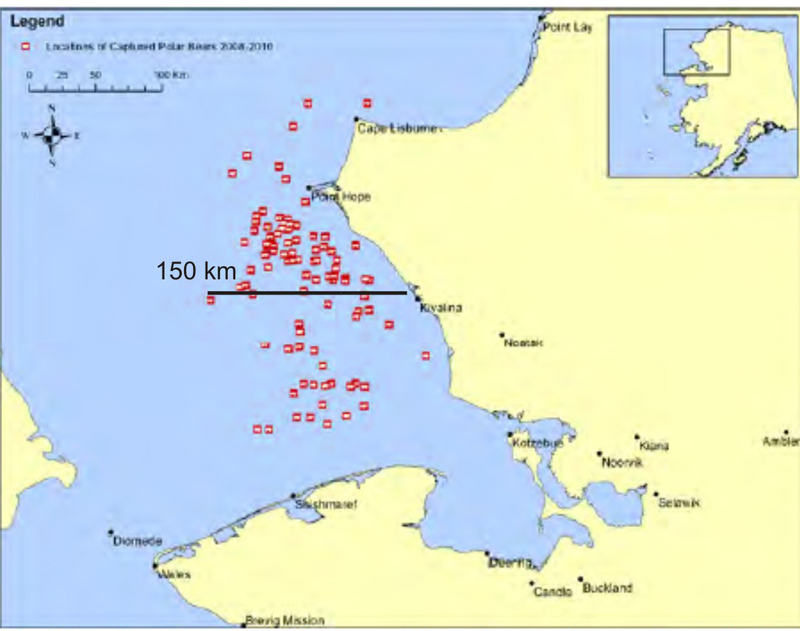 Note none of the captures was further from shore than about 150 km. Adapted from map provided in Polar Bear News 2010 (distance added, based on scale provided). See how this compares to the entire Chukchi subpopulation boundaries as defined by the Polar Bear Specialist Group (PBSG), below. Figure 3. Approximate portion of the total Chukchi subpopulation of polar bears that was surveyed by the research teams (dark pink) of the US Fish and Wildlife/US Geological Survey in 2008-2010. In addition, a 1240 lb male was captured during the 2008 field season (Fish & Wildlife 2009). As the average weight for a male polar bear is about 900 lbs tops, these Chukchi weights over 1200 are well above average. In the 2010 portion of the Chukchi survey, the bears were said to be in average (good) condition: according to their “body condition index,” which ranges from 1-5, with 1 being skinny and 5 being very fat. 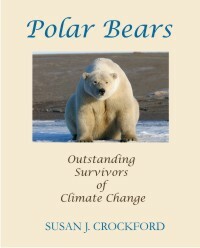 The FWS team classified 67 bears out of 69 as index 3 (average)(Rode and Regehr 2010:7). That is pretty impressive, considering that March and April are just the beginning of the spring feeding period. The average weight of adult males was 1016 lbs, of adult females 545 lbs. “The large number of yearlings captured in 2010 differed from 2008 and 2009, when only four and one yearling(s) were captured, respectively. This suggests that many females gave birth in maternal dens during the winter of 2008-2009 and were successful at rearing their cubs through the first year of life.” (Rode and Regehr 2010:1). 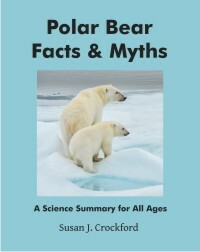 What is rather astonishing, however, is that Rode and Regehr fail to mention in the text what their accompanying figure demonstrates: some of these Chukchi polar bear females are giving birth to triplets. Figure 1 (copied below) shows a female with triplet yearling cubs, who clearly all survived their first year of life. That is pretty extraordinary, given that only a few populations outside Western Hudson Bay have recorded triplet births and mortality rates of cubs in their first year are usually rather high. Given the numbers Rode and Regehr provide, it appears that at least one (and possibly two) females out of the 14 they captured were accompanied by triplets, 7% (or 14%) of the total sample. If only one female had yearling-aged triplets, then nine females each had two cubs that survived their first year – and some of these may have started as triplet litters. 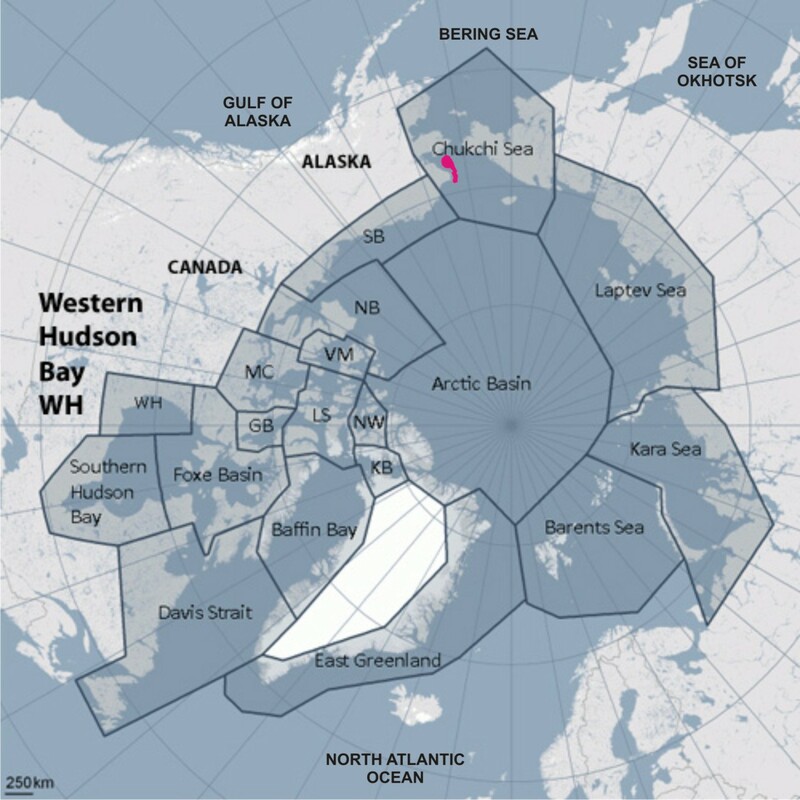 A triplet rate of at least 7% in the Chukchi puts the production of triplets there into the range seen in Western Hudson Bay (12%) and Southern Hudson Bay (6%), as discussed previously. This rate is also much higher than the 2% rate reported for Wrangel Island in 1969-1970 (where many female bears caught in the Chukchi are presumed to make their birthing dens). The sample size is small but one triplet litter out of 14 is encouraging and suggests the Chukchi Sea bears are doing very well indeed. The Chukchi researchers saw no cubs-of-the-year (i.e. < 6 month old cubs). However, they report that the tracks of a female with twin cubs-of-the-year were seen in both 2009 and 2010. Since the researchers admit that the only known land-based denning area for pregnant polar bears is on Wrangel Island – too far from the F&W survey region for new cubs to have travelled in such a short time – it suggests (although Rode and Regehr don’t say so) that these tracks were left by females who had given birth in a sea ice den (see previous post on sea ice denning here). Figure 4. 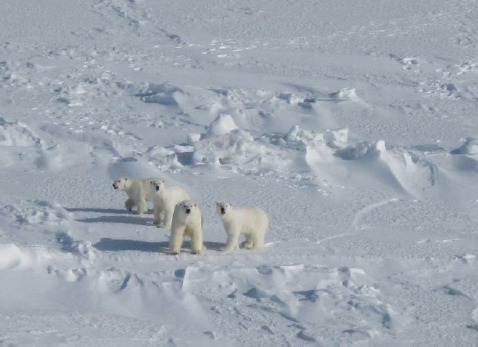 Female Chukchi Sea polar bear with one and a half year old (“yearling”) triplet cubs. From internal report by Rode and Regehr (2010:4). All in all, good news – no population estimate but some record high weights for males and at least one triplet litter suggests that Chukchi Sea polar bears – which are not currently contributing to the global total population estimate – are doing very well indeed. In their report, Rode and Regehr (2010:9) promised, “We plan to submit analyses that are completed within the coming year to peer-reviewed scientific journals for publication.” I haven’t seen one – and it’s now 2013. 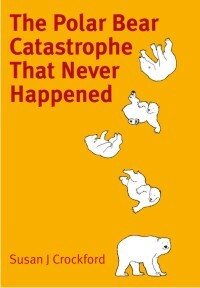 A report on the first three years of data was compiled for a US-Russia meeting in March 2010 under the polar bear treaty (Polar Bear News 2010:22) but has not been released to the public. However, co-investigator Karyn Rode did respond to my email enquiry a few days ago and told me that they had a manuscript in review and two others that are in progress. They anticipate that the paper that is currently in review may be accepted for publication within the next 3 months. I am looking forward to seeing this “in review” paper. Will it contain a population estimate or will that be saved until after the Polar Bear Specialist Group meets this summer? My guess is that the conclusions of the population estimate will be discussed at the next PBSG meeting this summer (and cited as “submitted” to peer-reviewed journals), and used in decision-making processes, but that we won’t see any peer-reviewed papers published on the status of the Chukchi subpopulation until after the PBSG meeting report is made public with great fanfare. Seven months of investigation on this topic has made me a bit cynical, I guess. Let’s hope I’m wrong. This entry was posted in Life History, Population, Sea ice habitat and tagged Bering Sea, Chukchi, Polar Bear Specialist Group, population estimate, Regehr, Rode, triplets, unpublished data. Bookmark the permalink.